I’ve just finished three teeny, tiny sample-sized beauty products and thought I’d give you a quick mini-review on each. I’ve had these in my makeup bag for a few weeks and have been taking them away with me on overnight stays at various places – please excuse the photograph, it’s actually quite hard to take pictures of things when the insides of the glass bottles are all oily! 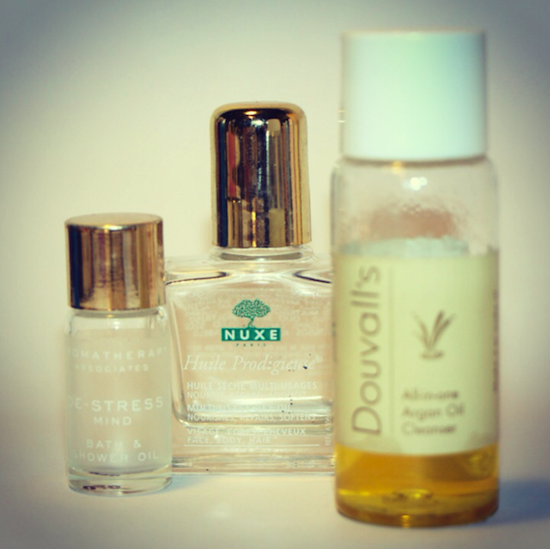 So, from left to right, we have the Aromatherapy Associates “De-Stress” bath and shower oil. The full size is £37 here but you can get a smaller version as part of the “essentials” set, which is £23.50 here. I know that I harp on about these oils all the time, but I do find them to be properly effective – if I need a bit of a pick-me-up then I know that the Revive oils will do the trick. If I feel totally stressed and overwrought, then I turn to the De-Stress versions. The De-Stress Mind (there’s also one for body) is perfect for frequent travellers. I only use about half of a tiny capful at a time, you really only need a few drops to get the full effect. In fact, I find that if I use more than a capful, even the trial-size cap, it’s a little OTT and the oil coats the top of the water. So, although the full-size bath and body oil seems like quite expensive, it does last a very long time if you’re sensible with amounts. I have a whole other stash of little samples that I’m testing out, so I’ll be back with another set of mini-reviews soon. Any requests? Previous Post Do I Look Fat Like This?